To James B Kenworthy, a valued friend and mentor Without his willing help and encouragement this project would never have taken place. The large blade (left), picked up during family fieldwalking (1978-9) at Crathes, was only recently identified as being ‘definitely possible Late Upper Paleolithic’ by Torben Ballin, via Caroline Wickham-Jones (pers com). The major part of the assemblage relates to the Mesolithic with diagnostic broad (top) and narrow blade (lower right) microliths together with microburins (lower left). 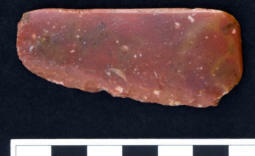 An Early Neolithic component is indicated by leaf-shaped arrowheads (upper). Flaked knives (lower left), and a ground and polished knife (lower right) show Later Neolithic activity. A barbed and tanged arrowhead (right), also picked up during earlier fieldwalking at Crathes, suggests later activity in the Early Bronze Age. Modern humans ( Homo sapiens ) arrived in Britain about 40,000 years ago, after a period (180,000 - 60,000 years ago) of severe ice-ages. The last of these, the Younger Dryas, ended about 11,700 years ago. Until recently, it was thought that evidence for human occupation of Scotland dated only to the Mesolithic period (ca. 4,000 - 8,000 BC), but more recent fieldwork has pushed this back to the Late Upper Paleolithic, going back to 12,000BC, closely following the retreating glaciers. Lithics dating to this period have now been identified from a few locations along the banks of the River Dee, including the river bank at Crathes. This website describes the fieldwork done by OFARS along the northern river bank at Crathes, to discover the extent of the scatter, now thought to be one of the largest Mesolithic sites in the UK. The OFARS collection also included diagnostic implements showing activity during the Neolithic. Earlier family collections indicated an Early Bronze age, and a possible Late Upper Paleolithic presence. Microliths, originally referred to as ‘pygmy flints’, are small worked pieces used in making composite tools. Microburins are waste products resulting from the manufacture of microliths. After the hunter/fisher/gatherers of the Paleolithic and the Mesolithic, the Neolithic period (ca. 4,000 - 2,500 BC saw the introduction of pottery and farming. 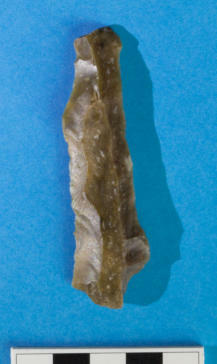 During the transition to metal working, flint implements were still being made in the Bronze Age (ca. 2,500 - 800BC), . Hand-held GPS was used for recording the E and N co-ordinates of each find, and Microsoft Excel for cataloguing, recording of attributes, charting the spacial distribution of the flints (almost 10,000), and for further lithic analysis.